Have you been eating and a pesky fly won’t leave you alone? All I can think of is how that fly used to be a maggot. Dialogue tags can be like that, distracting to the point where you just want to throw your meal away. I have also put books down and not finished reading because of distracting tags, especially ones with adverbs. She was talking about attribution in nonfiction articles, but the same is true for dialogue tags in fiction. There is a time, especially in fiction, where it is appropriate to use tags such as “mumbled.” However, most of the time “said/says” or “asked/asks” is sufficient. The tags become invisible and are less distracting to readers, like that pesky fly. As for order, I have noticed British editors favor “said (name)” and American editors prefer “(name) said.” Keep in mind, like most rules, this one is not set in concrete. The correct punctuation if the character smiles, or grimaces, or winces, is to put a period before the end quotation mark, then have the speaker make his facial expression in a separate sentence. The reason is because facial expressions are actions, not tags. “Jacob, did you finish your homework?” Mother called from the kitchen window. I would caution against overdoing this technique. Only use it when it sounds natural. Better yet, people do things while they talk. So often you can omit the tag and have the speaker do an action, called a beat or Piece of Business (POB). Besides eliminating tags, a more important reason to use Piece of Business (POB) is to keep the action and plot moving instead of having sections of “talking heads”, where two or more people stand or sit around doing who knows what except yakkity yak yak. A POB, or beat, is a sentence that goes before, after, or in the middle of a piece of dialogue to indicate who is the speaker. It is a separate sentence with subject and verb, a capital letter at the beginning and a period at the end. He scratched behind his ear. "Not a bad idea." "We are in no danger whatsoever." The queen brushed him away. "I, that is, we..." He rubbed his chin. "Actually, that's not a bad idea." A speech tag, on the other hand, must have a verb of speech in it: said, shouted, called, wondered out loud, asked, and so on. It is separated from the piece of dialogue with a comma. A beat can have a verb of speech—He cried out his horror to all who would listen—but it doesn't need one, as the examples above show. Often novice writers use dialogue for information drops and tags to tell emotion. 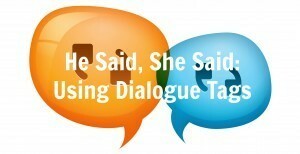 Instead, dialogue should be interesting, even provocative, and move the plot forward. While POB is a great place to show an action that reveals emotion and thoughts (internal monologue). Here is an example in my novel NO SURRENDER SOLDIER (P. 34). Kiko resents babysitting his grandfather and calls his best friend Tomas to come over and play baseball. “That’s not funny.” I didn’t like someone joking about ancestral spirits that live in banyan trees. The stories gave me the willies. "You never know, maybe the spirits play baseball in the boonies.” Tomas looked ready to launch into a ghost story. A shiver ran down my neck. Notice that this section never used “said” or “asked” and yet the reader knows who is speaking, what the two teens are doing, and how Kiko feels and what he thinks. The purpose of tags (and attribution) is to make it clear to the reader who is speaking. The purpose of using “said/says” and “asked/asks,” which are invisible tags, is to avoid distraction from the story itself. The purpose of POB or beats is to show what is happening while the dialogue takes place, to move the story forward, and to keep the story flowing in a way that the reader loses himself in the story itself and the art of the storytelling.